Our knowledgeable and experienced members have written a wide-range of publications demonstrating their mediation expertise. The opinions reflect those of the author of the publication and not necessarily the International Academy of Mediators. Below you will find some books written by our members. If you would like to submit a book to the website, please contact Richard at richard@iamed.org. Agreed! 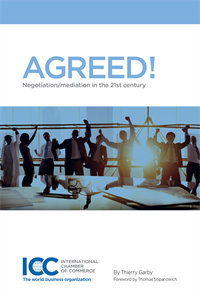 Negotiation/Mediation in the 21st Century by Thierry Garby (2016). To order a copy click here. Bringing Peace Into the Room: How the Personal Qualities of the Mediator Impact the Process of Conflict Resolution by Daniel Bowling and David Hoffman (2003). Stories Mediators Tell by Eric Galton and Lela P. Love (2012). Explore inspirational stories on the art of mediation through this collection that offers first-hand accounts of the unpredictable and often dramatic nature of mediation. The Mediation Process: Practical Strategies for Resolving Conflict by Christopher W. Moore (2003). To order the most recent edition click here. Improvisational Negotiation: A Mediator’s Stories of Conflict About Love, Money, Anger and the Strategies That Resolved Them by Jeffrey Krivis (2006). How To Make Money as a Mediator (And Create Value for Everyone): 30 Top Mediators Share Secrets to Building a Successful Practice by Jeffrey Krivis and Naomi Lucks (2006). The Conflict Resolution Toolbox: Models and Maps for Analyzing, Diagnosing, and Resolving Conflict by Gary T. Furlong (2010). 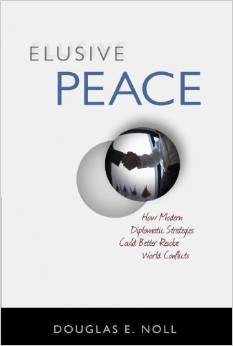 Elusive Peace: How Modern Diplomatic Strategies Could Better Resolve World Conflicts by Douglas E. Noll (2011).